I’ve remarked before that Democrats are the evil party and Republicans are the stupid party. Well, if anyone needs additional proof about GOPers being clueless and tone deaf, exhibit A is Congressman Rick Crawford of Arkansas, who has decided to preemptively capitulate in favor of higher tax rates. Here are the relevant details from a Politico story. Freshman Republican Rep. Rick Crawford will propose a surtax on millionaires Thursday morning, a crack in the steadfast GOP opposition to extracting more money from the nation’s top earners. The Arkansas Republican will unveil the plan during a local television interview Thursday morning, and plans to introduce legislation when the House returns next week, according to sources familiar with his thinking. Crawford will propose the additional tax— expected to be north of 2.5 percent — on individual income over $1 million as part of a broader fiscal responsibility package. I have no idea if Congressman Crawford is simply naive, unaware that tax-increase deals inevitably lead to higher spending and more red ink. Or perhaps he’s trying to become the kind of Republican who thinks he can advance his career by saying things that will earn him pats on the head from the establishment media. But I do know that America’s fiscal problem is a government that is far too big. You don’t solve the problem with more taxes, just as you don’t cure alcoholics by giving them more to drink. Congressman Crawford, though, wants to give away the keys to a liquor store without even asking for an insincere commitment for future sobriety in exchange. 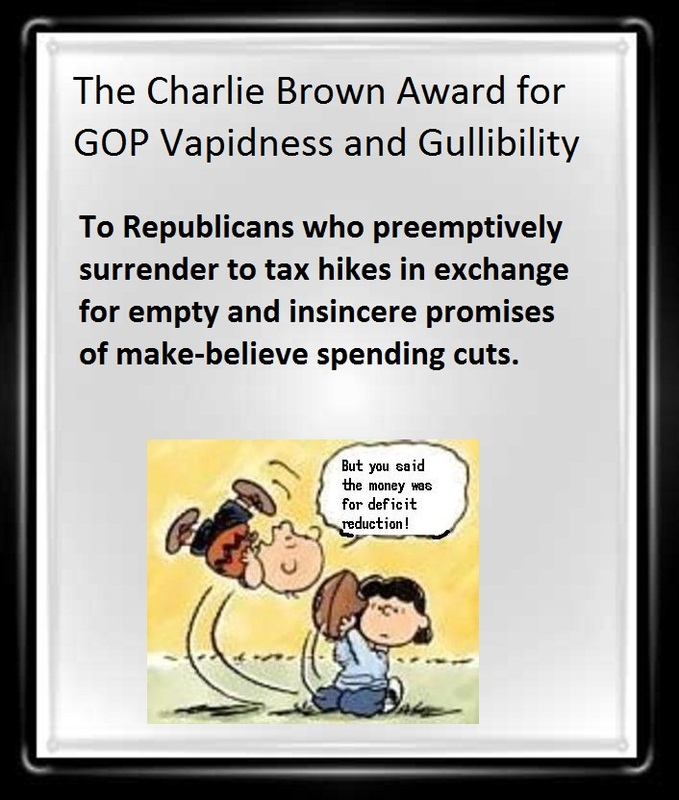 Indeed, the Congressman’s naiveté is so impressive that he is the first winner of the Charlie Brown Award for Vapidness and Gullibility. There’s a rumor that he is sending former President George H.W. “read my lips” Bush to collect his award, but I’m unable to confirm at this point. This new award is part of a series, with the “Bob Dole Award” having been announced earlier this year. on May 12, 2012 at 1:51 pm Will House Republicans Get Bullied into a Tax Hike By Obama? Liberals like the NY Times have praised Crawford, but I see that it may lead to him losing. President George Bush was talked into raising taxes by Democrats and then a Democrat beat him in 1992 and he got kicked out of the White House. Is there any honor among thieves? Keep up the good work. I have posted hundreds of your articles in the last 15 months and have over 170,000 hits on my blog since starting it in Dec of 2010. Reagan said he regretted going up on taxes in 1982 because even though the Democrats promised him double spending cuts for every one dollar of tax increase, the tax increase was passing asap and the spending cuts were never passed. America’s problem is not a government that’s too big, but a government that is becoming almost as big as the average world nation’s. Economic convergence will thus inevitably follow political convergence. Americans can thus kiss goodbye their taken for granted six times world average prosperity levels.